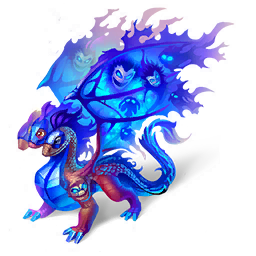 Dragons World: Many Faced Dragon! Many-Faced Dragons are beautiful, mysterious and crazy about red roses. In other respects, they're nothing but a problem - each head of the Many-Faced Dragon has its own mind. One moment, the dragon is helping with the chores, and the next it's flirting with a Midnight Dragon. But there's no denying it - there's a certain style to the Many-Faced Dragon's mischief.